Low tack or high tack adhesive wallpapers or vinyl / fabric wallpaper, whatever design you require. Stretch fabric frame displays, banners, roll up banners, Signal sided posters up too 400gsm, Window and floor graphics on self-adhesive vinyl's. We can supply freestanding or wall mount signal and double sided lightboxes, aluminium free standing frames signal or double sided. Frames come flat packed for easy assemble. Established in 2018, Infinity Colour has already proven itself as a key player in the printing industry. Our directors and owners Nigel and Dave have many (more than they care to admit!) years of experience in the print industry. They've seen the good and the bad, taken the rough with the smooth, learnt a lot; possibly forgotten more than most in the print industry know. Taking all this invaluable experience, knowledge and hard work, they founded Infinity Colour Ltd to give a new look to an old industry! 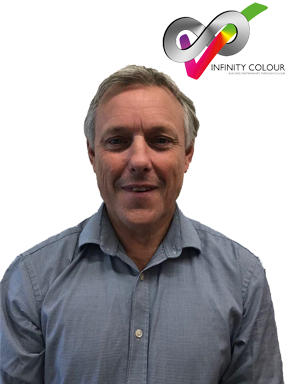 David has been in the print trade for over 34 years, working for various companies. His vast experience in printing and engineering, having worked as an engineer on all type of printing & finishing machinery and became head of engineering for a major and successful web offset printing company. As a senior manager for the company, he understands the importance of quality and time schedules for clients, as well running a successful personal business for several years. 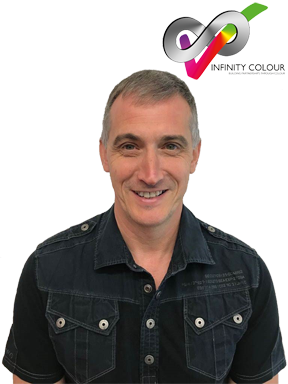 He is very dedicated to the work Infinity Colour offers its clients and always strives for the best quality and goes the extra mile to ensure that the client gets a high quality and superior product every time. David has vast experience in CAD and design, as well as a good working knowledge of most Adobe and rip software, he has also worked with ISO standards for many years. As an Operations Management Expert in the field of Production and Operations Management, I’ve continually found my greatest successes have been achieved in the areas of Production management. My whole working life has been set around graphics Studio's from camera operator to final output to various print devices. Past roles, I have carried out multiple task such as running of manufacturing across three departments, adherence to schedule-OEE, OTD, customer service, security of customer data, and quality adhere to quality industry standards. I am known as a versatile contributor with experience in all cores of operations management functions, top-flight consensus-building and problem-solving skills, and the ability to make difficult decisions. Here at Infinity Colour, we pride ourselves on our quick turn around times. We won't keep you hanging around! Our print equipment is state-of-the-art and we invest heavily in our kit to ensure the best quality product for all our customers. With over a combined 50 years experience in the print industry, you can rest assured that we will deliver on your project. Your work is as important to us, as it is to you. Trust us when we say, your work and your business are safe and secure in our hands. We won't let you down. This is personal to us and we will deliver, or your money back. That's our promise to you. We don't like to be beaten on price. We will ensure we are competetive so speak to us before using the other guys! Give us a call or drop by, we endeavour to answer all enquiries within two hours on business days. Copyright ©2019 Infinity Colour Ltd. All rights reserved. Registered No: 11174887. Web services provided by AuroraSaaS. Your IP: 3.84.182.112.